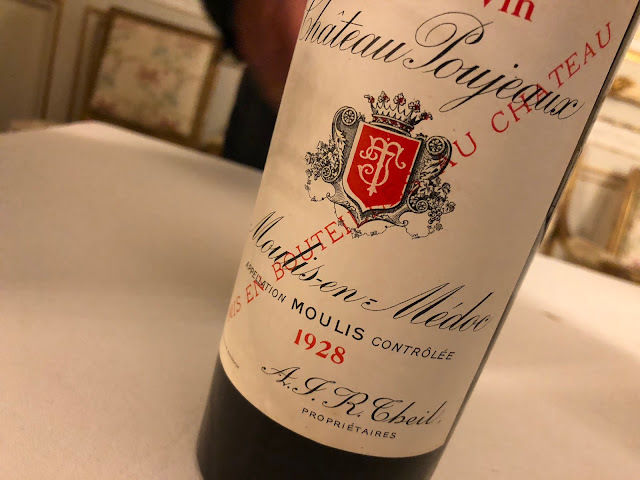 This week I received a very friendly invitation to join a special dinner at Christie's Amsterdam, a dinner featuring the renowned wines of Château de Beaucastel (Châteauneuf-du-Pape). Fifth generation winemaker Marc Perrin would be hosting the evening. I didn't have to think very long about accepting this invitation or not. So yesterday, surrounded by classic paintings, I tasted a flight of Beaucastels together with some twenty other lucky winelovers. Hence: this was yet another memorable wine evening to add to my list: extraordinary wines, great atmosphere, delicious food, and a unique place. 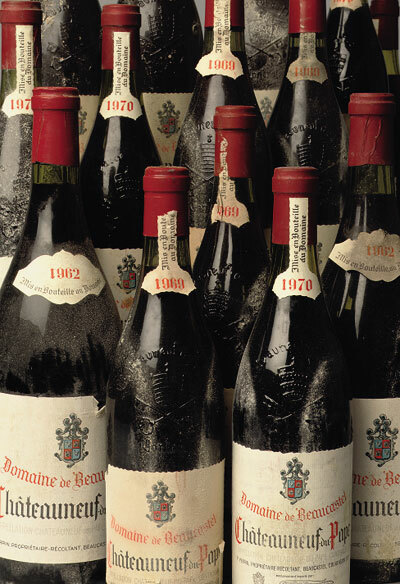 The event was a warming-up for the auction to be held Tuesday 25 November, with an unusual number of wines from Château de Beaucastel, from the vintages 1962, 1966, 1967, 1969 (many), 1970 (also many), 1990, 1995 and 2005, all red - plus a small number of whites. Before I return to the Beaucastels... I must say there are some pretty exciting lots that are going to be sold at this upcoming auction. E.g. from the collection of Hans Jorissen there are some very rare Tokajis, the oldest being from 1834. And there are more interesting dessert wines in this collection: Ports (the oldest from 1851), Madeira's, and some old Sauternes again. In October I already had the luck to taste a Château Filhot 1935 from the same collection, and now - among other grand dames - Château Filhot 1925 and 1926 are put up for auction. Also quite interesting: there's a whole lot of Domaine de la Romanée-Conti for sale. Back to Château de Beaucastel. Or actually to Marc Perrin (1970) whose explanations were very interesting. For example the fact that Château de Beaucastel is one of the very first domains to work organically, already since the 1950s! It was - simply - done for the sake of quality. Fertilised vines are lazy vines. And quality requires vines to dig deep, deep into a healthy, living soil. Healthy and alive, because free from pesticides. For Perrin it is pivotal that roots descend deep into the ground, in the case of Beaucastel sometimes up to 30 metres! Another fascinating thing I heard (and this accounts for the red wines), is that after the berries are being destemmed, they run into a sort of narrow tube in which the skins are heated, really short, and instantly cooled down afterwards, after which they plunge into the fermentation vat. The reasons: 1. the heat breaks the skin (as an alternative to crushing the grapes), and 2. the organisms that cause oxidation are killed, so upon entering the vat the grapes do not need to be sulphured. The wines. In general: pure and very well-balanced, and impressive. I very much enjoyed the rare Beaucastel blancs from 2006 and 2007. The 2006: rich nose, honey and flowers. Very broad, soft texture. The start is spicy, then it is fat and intense (oily like a grand Burgundy). A long finish. Wow. The 2007 is even more seducing. Very modest oak, beautiful fruit, good acidity. Broad and soft. A complex wine. And delicious. Then the reds. The ultimate blends: 13 grape varieties are used. The magic of Châteauneuf-du-Pape is the search for the perfect blend. The quest for harmony, in which there is very few place for oak. Perrin sees oak as make-up, as a factor that is concealing something - and nothing should be concealed here! Thus oak is not used to add something to the wine, but only to soften it, to soften its tannins. Château de Beaucastel 1990. Meaty, school-paint, round and ripe fruit. Powerful (structure) yet soft (texture). The 1989 vintage is more polished, more lean (is has the perfect figure). The wine is refined, very well-balanced. Beau-ti-ful. Then it got even more exciting: the 1970 vintage. An unbelievable wine. So vital, so harmonious. Complete, mouth-filling yet elegant. Almost youthful (or maybe just forget the almost). Ravishing. So beautiful and comme il faut that it is hard to describe. The 1969 clearly showed its age (other than the 1970), its nose a bit oxidized. But once in the mouth, another beauty. Very refined, suave and beautiful. We said goodbye to a great evening with a splendid Rieussec 1999. At this point I won't run into the details of this Sauternes. But it was also... very good.